ST. GEORGE — Victims of domestic violence can be lonely, isolated or feel like they have nowhere in the world to seek out help but one local organization is always ready with an open heart to assist and Monday morning it received a major donation to support its program. Not to be hampered by the rainy skies, a check presentation was held inside the glass-walled lobby of Findlay Hyundai St. George located at 1405 S. Sunland Drive to commemorate the end of a sales event to benefit the Dove Center of St. George and its mission to empower survivors of domestic violence and sexual assault through education and a wide variety of resources. 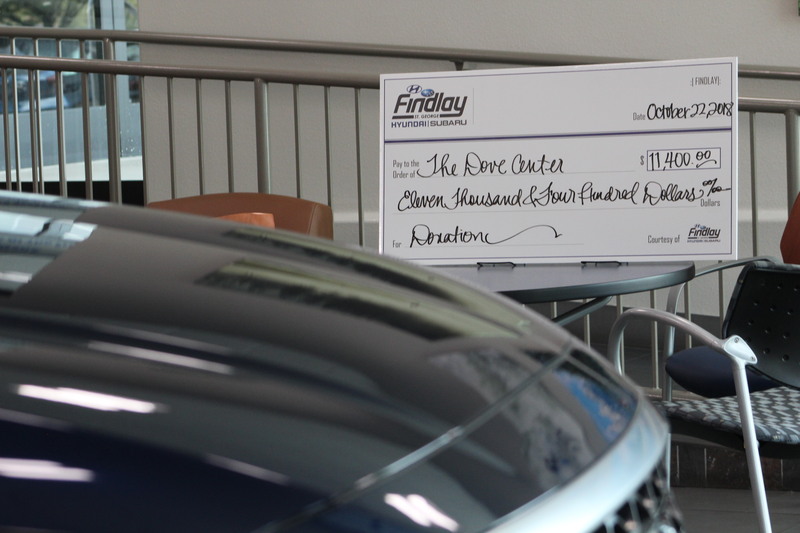 The fundraising campaign began at the dealership on July 1 and for every new or used car sold, a donation was made to benefit the Dove Center. Over the past three months, $11,400 was raised, marketing director Karyn Keanaaina said. One in three women will experience some form of domestic violence in their lifetime and one domestic violence related homicide happens every month in Utah. According to a recent Utah Department of Heath report, intimate partner violence affected 18.1 percent of adult females and 10 percent of adult males in Utah in 2016. Less than 15 percent who have experienced it ever reach out for help. The most commonly reported reasons for not seeking help include believing the abuse will stop, believing the person who physically hurt them will find out that they disclosed the abuse, not wanting help or believing their children would be taken away from them. The Dove Center offers victims and survivors a safe space and makes the necessary tools available to help them pick up the pieces of their lives and begin again. They can provide shelter, meals, education and family counseling services. The center is trying to build up its children’s programs, increasing the services they can offer. The donation will bolster those efforts and help bridge the gap from a loss this year of funding for their prevention program, said Lindsey Boyer, executive director for the Dove Center. Boyer said federal funds can be used for awareness and services, but they cannot be used to educate on the prevention side. Private donations like Findlay’s are beneficial, due to their flexibility, allowing them to support other areas of work they do. Building community awareness has been a priority over the last couple of years, Boyer said, because it is one the best ways the people can help out on their own. Sometimes having a neighbor, family member or friend who understands the cycle of violence and how to get help, can be a voice of reason and aid someone in a dangerous or toxic situation. Their goal is to educate an army of community members in the hope that more people will access their services. “Having someone in the community that is knowledgeable and understands, makes it a lot easier to have the conversation,” she said. Before taking on her role with the Dove Center, Boyer worked directly with families in crisis as part of mental health service provision and said her position now allows her to see the other side, the experience of giving and serving from the community standpoint. She said one of her favorite moments came just a few weeks into job when a private citizen auctioned of his classic truck for $16,000 and donated the entire amount in the hope of aiding children. For more information on how you can lend a hand, go to the Dove Center website or call the Dove Center’s 24-hour helpline at 435-628-0458 for emergency shelter and other questions about domestic violence or sexual assault.